I prefer a side part with this look but you can do center if you want. Up near your part, grab two small sections of hair. Once you pass the ear, go ahead and switch it to a regular fishtail. In other words, just stop taking new pieces and fishtail the normal way. Tie it off with a tiny clear elastic once you get to the end. On the other side, you’re going to do two regular tiny fishtails. Tie those together using a tiny clear elastic once you get to the end. Pull both sides back and make sure they can meet because you’re going to bound those two clear elastics together using a small bobby pin. Clip up the top layer of hair. Join the two sides together in back and drive a bobby pin between each elastic, anchoring the two rubber bands together. Now drop the top layer and let it hide the place where you joined the braids together. 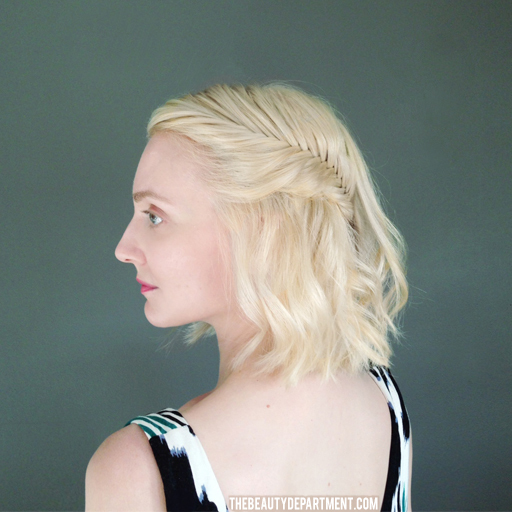 Throw some simple waves in there using a 1″ barrel iron or a wand. 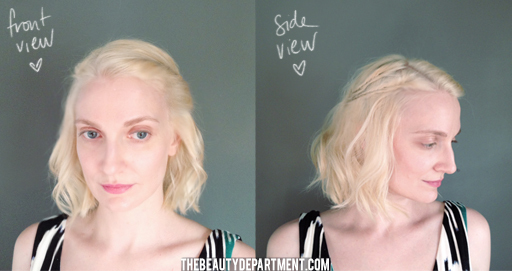 Add a light veil of hairspray and check the back in a mirror! Here are some additional images so you can see it from all angles. Hope you guys love this. If you try it we would love to see it! Tag us on insta @thebeautydept. Have a gorgeous weekend! !